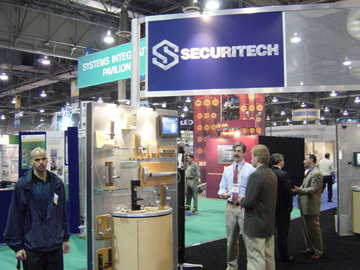 Trade Shows can be an effective venue for selling your product or service. Often there are thousands of customers in attendance, and they use the show as a way of seeing what's available in the marketplace. This makes for a great way of seeing a lot of qualified people in a short period of time, and at much lower cost than visiting them all with direct sales calls. I've participated in over a hundred shows, and produced materials for thousands. If you are a small company thinking about going to a show, or trying to get more out of the ones you go to, here's what I've learned. There are really three phases of doing a show well. Let's take them one at a time. Before: Plan your pre-show work. During: What you'll do at the show. After: How you'll follow up. You can often get great booth locations if you make your reservations early. Don't let them assign a booth for you, ask what's available, look at the show layout, and get a booth that's not in the boonies. Try to be no more than a few aisles over from the main entrance, and not all the way in the back. Try to stay away from a second room of the show, which tends to get much less traffic. Most people will pass down the main aisles several times, and visit the back rooms only once, if at all. Pay a little more if you must for good location it's worth it! The booth space in local shows will be a few hundred dollars, a good national show $3-5000, and something like CES can be much more for a 10x10 booth. Depending on the show, you can often bargain for space late in the game, but you may miss the publishing deadlines for the show bulletin, etc. Leftover show space is a great thing if you're thinking of attending a show, but not really sure if it will work for you. Usually, you'll need to put a deposit with your reservation and the balance a month before the show. Also, there are often weird size booths that you might be able to use and that you can get a great deal on. I once got booth across from the concessions between the main and secondary show rooms. Huge traffic, and since it was only 8' deep (no problem for my booth) was about half price. Some show managers will bargain like crazy, others not at all, but it's always worth a try. You'll get a show kit from the sponsors telling you how to ship things to the show, what you can rent for furniture, etc. 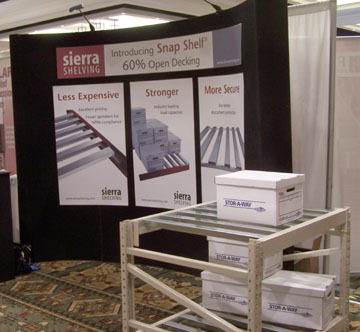 Remember that in the bigger shows, you usually rent a 10'x10' booth space without carpet, power or any furnishings. Pay attention to the checklist of things you need to do, and the deadlines. You pay steep penalties for placing your orders after the deadlines. Tell your customers what booth you'll be in, and invite them to stop by. Send them a show invitation. Mention that you be at the show, and give your booth number in your next email blast and on your web site. For small companies, this gives you credibility. For all companies, it gives you exposure and the chance to see your customer one more time in person. A press release in the industry magazine, giving your show booth, may help bring customers into the booth. Author an article. Give a seminar at the show. Run an ad in the trade magazine or show bulletin. Do something that puts your name in front of the customer so that there's a little recognition when they see your booth. A little thought and planning can generate a great booth without a great deal of expense. Have a colorful graphic that catches the customer's eye. Have a headline of six words or less that will interest your target customer. 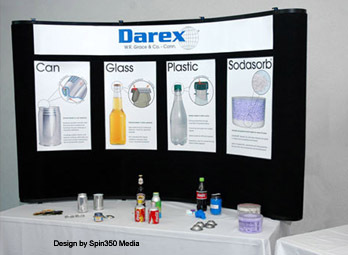 For my business, it might be "Trade Show Graphics - Easy and Affordable." Very often, something that helps you explain your product as you talk to the customer can be very useful. Customers go to a show with a mental list of things they want to learn about and perhaps buy. I can't tell you how many booths I see at every show that do not clearly tell you what they are selling. Most customers will not take the trouble to ask, they just pass you by. Tell them what you do! After that, the training of the people in the booth is paramount. More on that later. You can buy display booths for prices starting at about $2500 for a 10 footer. 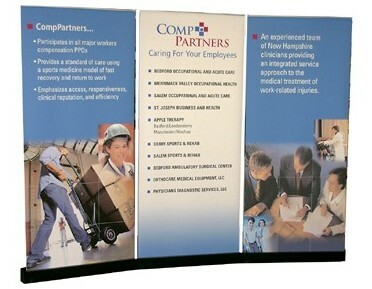 There are used and reconditioned booths out there too ( google used trade show booths), and we can make repacement panels for them. For small companies on a limited budget, a couple of good graphic displays hanging from the back curtain pole, along with a rented table attractively arranged with your product, will work. Booth manufacturers will try to sell you on a huge graphic that becomes the entire face of your booth. While they are striking, they are expensive, and if your product changes a lot you'll be spending a lot. We can sell you a booth like that too, and they are great if you think you can use it for several years. If you are on a strict budget, my advice is to buy a booth with the carpet on the face, and buy graphics that can be attached with VELCRO® Brand fasteners to it like this booth. When you want a picture of your new product in the booth, you can have it for a few hundred dollars instead of redoing the entire booth. You can buy an inexpensive tabletop booth for under $600 including the graphics. 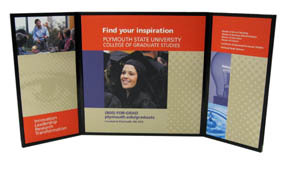 These are great for smaller shows where you are displaying on a table top. The whole thing fits into a box the size of a suitcase, and it's easy for a sales person to put in their trunk for local shows. We see a lot of companies giving one of these to each of their sales people. 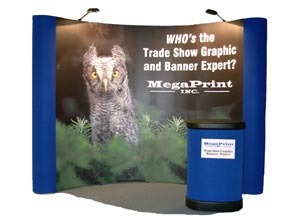 We are seeing a lot of banner stands at trade shows these days, and for good reason. You get great looking graphics, you can carry them into the show, and you can move them around to take best advantage of how things lay out between you and your neighbors. We've also done a lot of banner stands where three of them go side-by-side to make the entire booth, as shown at the right. Remember that on top of the expense of the booth itself, you need graphics that show your product- big photos, illustrations, computer screen captures, etc. You'll want a sign with your name and logo. Don't use the crappy black and white sign they give you with the booth, it labels you as an amateur. This is like packaging for consumer products: it must set you apart on the shelf! Whatever you do, remember that you have about two seconds to catch the eye and then the mind of the prospect. Good graphics do that, a wrinkled and smudged vinyl banner does not. Find someone who knows how to do good show graphics. Saving a couple of hundred dollars after all you're going to spend on the show is false economy. I know, I've been there. It's a shame how poorly some companies portray themselves, at great expense, in every show I've ever been to. People love to pick up freebies at the show! Mostly, they give them to their kids, and I doubt that you really get much benefit from giveaways. If I had an idea for something I knew the customer would keep on his desk, I'd give them away in my booth. You see less and less being given away at booths these days, and my advice is to spend your money on something else. Yeah, trade shows are expensive! 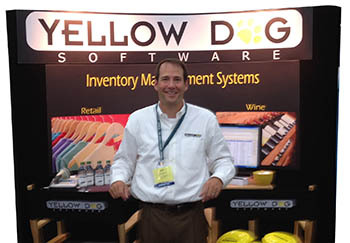 Murphy's Law is alive and well at trade shows! Things will be damaged or lost in shipment. The computer will blow a hard drive. You'll need an extension cord. Be prepared for these contingencies. Know how you'll solve the problem. I once bought our product from 10 different stores in Las Vegas because the samples didn't show. Expensive, but better than having an empty booth! Most importantly, verify that everything has been received at the show before you go. Ship it all in one box or on one pallet if you can. I try to carry enough brochures and spare graphics with me on the plane that I could make a go of the first day of the show if nothing showed up. For most folks, that's not practical, so be sure your stuff is there. Fedex is best, truckers are worst. Set up your booth the day before, with enough time to react to problems. Have a tool kit, since the union guys in the hall will want time and money to help you. For some reason, I've never been able to find a hardware store within 10 miles of a convention center, so bring your own tape, wire, etc. Have pliers, hammer, screwdriver and utility knife. Everything must be neat and clean for the start of the show, so paper towels and Windex are a must! Wipes that come in a plastic container are even better, since they don't leak. The doors open and in they come! Thousands of customers who can buy your product. The graphics work, and they enter your booth. What now? First commandment: know thy stuff! People in the booth should be able to answer customer questions knowledgeably. They should also be able to ask good questions of the customer, and show your product as the answer to his problem. In other words, good salesmanship. Have a pre-show meeting with everyone who will attend. What are the new products, brochures, etc. that will be at the show? What are the answers to the most likely customer questions? Pricing and lead time on the new products? Can they do this and that? Who's the dealer in my area? You may want to reward your finance guy with a trip to Orlando in January, but show booths are for sales people. Important customers can look very much like unimportant customers. You don't want to let a big fish get away! This is serious selling time, enough said! I try to get a business card from every person who visits. I put notes on the back of their specific interest. Most shows these days give every attendee a magnetic stripe or QR coded card you can scan into a machine to build a database. They are big time savers, and I recommend them highly. I also keep 3x5 cards in my shirt pocket to make notes about hot prospects whose names I put into the machine. I've never had the time to enter data into the machine about a prospect during a show. Also- they have portable machines that work on batteries, a big plus if you aren't planning on power for your booth. Make eye contact with people as they go by. When I see someone eye my stuff, I ask "can I show you what we do?" Most will stop and talk. I try to follow with a question pretty fast to get the prospect talking about what's important to him or her. If they are a lousy prospect, give them literature and thank them, and move on to another customer. There are lots of people going by, and you can't waste time here. It's probably costing you $500 an hour to be in the show. Make the most of it! Never count on the literature you give people to make it home with them. If it does, it often goes in a big stack someplace, rarely to be seen again. Get their information, and follow up! Adjust your booth to its weaknesses if you can, as you go. I had several people ask me how big my $45 print was, and that night I cut a photo down to 24x36" so I could just point to it. It helped a lot on days two and three, and made my booth work better. Evenings at shows, unfortunately, are for work and not play. Get everyone together over dinner and talk about what you heard. What are customers saying? What big prospects did you have? Who is coming by tomorrow that we should look out for? What should we be saying about this or that issue? I also use the show to keep an eye on my competition (and they do the same to me). I get a piece of their literature and especially their pricing. I walk the show to see what's new and important. I do a lot of this before the show opens every morning, because I hate being out of the booth during selling time. I keep a snack in my briefcase, and a bottle or two of water. I rarely eat lunch because of the long waits. It's a big no-no to eat in your booth- customers will not want to interrupt you. I'm here to sell, not eat. During a lull, I'll grab my snack, step out of my booth, and cram it down in a few bites, and get back in my booth. By the way, never leave anything like a coffee cup laying around your booth. It's just not professional. Briefcases, extra literature, etc. should be stowed out of sight. Follow up is the key here. People get a lot of information at a show, it's the reason they attend. You need to stand above the pile of things they collected, and the mountains of information they'll get in the mail from other exhibitors. My routine is to send the information out immediately upon returning. Like, within two days. The card scanner folks give you a disk or downloadable file of the people whose card you swiped, so it's fairly easy to do a mailing of a few hundred pieces. I figure the customer gets back after the show, cleans out their in basket from several days accumulation, and then has about a week of normal mail flow before all the other exhibitor's material starts to arrive. I want my stuff to arrive then, while I'm fresh in his mind, before everybody else's literature arrives. A month later a phone contact should follow. I want to be sure he or she has the information, and knows how to find us. After that, it's the normal sales process for your business. About the author: Jay Buckley is the founder of MegaPrint, a Plymouth, NH company specializing in large format printing.